Abdulnasser Gharem is an anomaly in the art world. 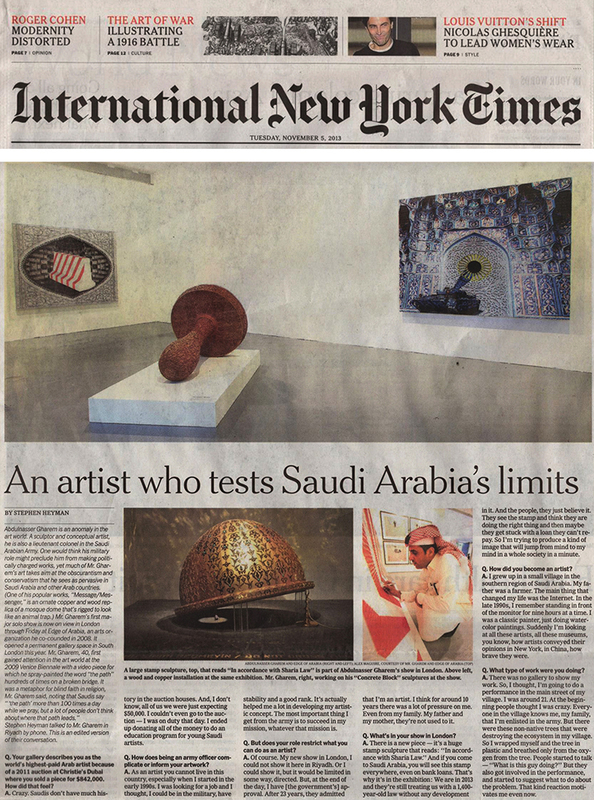 A sculptor and conceptual artist, he is also a lieutenant colonel in the Saudi Arabian Army. One would think his military role might preclude him from making politically charged works, yet much of Mr. Gharem’s art takes aim at the obscurantism and conservatism that he sees as pervasive in Saudi Arabia and other Arab countries. (One of his popular works, “Message/Messenger,” is an ornate copper and wood replica of a mosque dome that’s rigged to look like an animal trap.) Mr. Gharem’s first major solo show is now on view in London through Friday at Edge of Arabia, an arts organization he co-counded in 2008. It opened a permanent gallery space in South London this year.